Piqua’s Tylah Yeomans goes up for two points Wednesday against Stebbins at Piqua Junior High. Piqua’s Kenzi Anderson gets off a shot in heavy traffic Wednesday against Stebbins at Piqua Junior High. 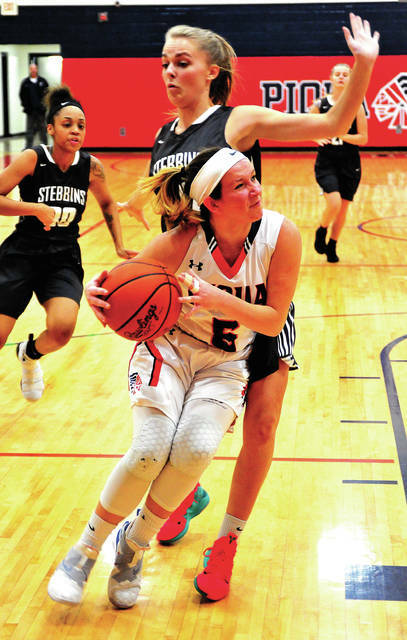 Piqua’s Izzy Kidwell has her eye on the basket as she gets around Stebbins’ Olivia Newlin Wednesday. 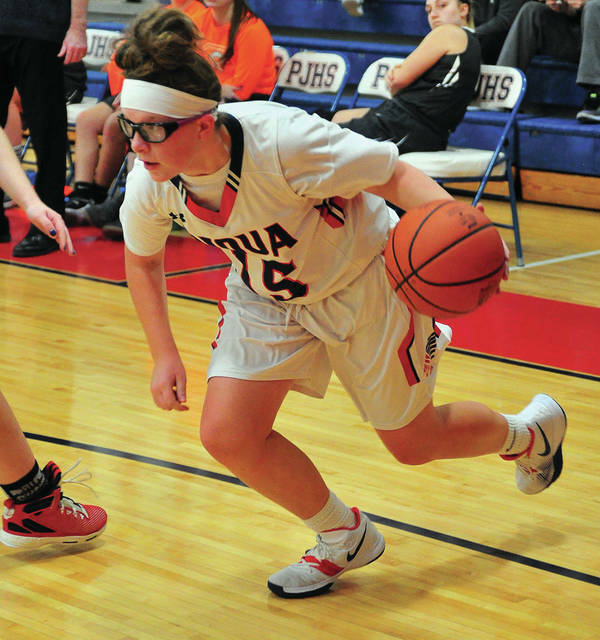 Piqua’s Karley Johns drives the baseline Wednesday night. Piqua’s Kelsey Bachman drives against Stebbins’ Korina Murphy Wednesday. 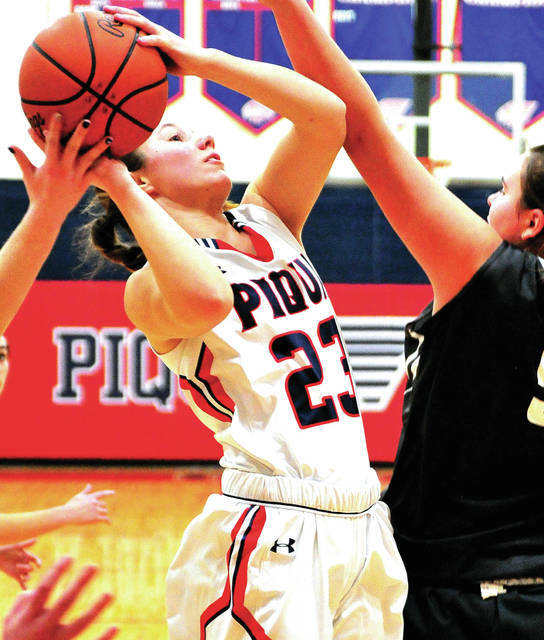 Piqua girls basketball coach Jon Dolph felt like he could breathe a sigh of relief after Wednesday’s 55-41 victory in GWOC American action for several reasons. While Piqua improved to 11-4 overall and 7-3 in GWOC American play, while Stebbins dropped to 4-12 overall and 1-7 in GWOC American play, nothing has come easy against the visiting Indians this season. In a non-conference game earlier this season, Piqua won in overtime. 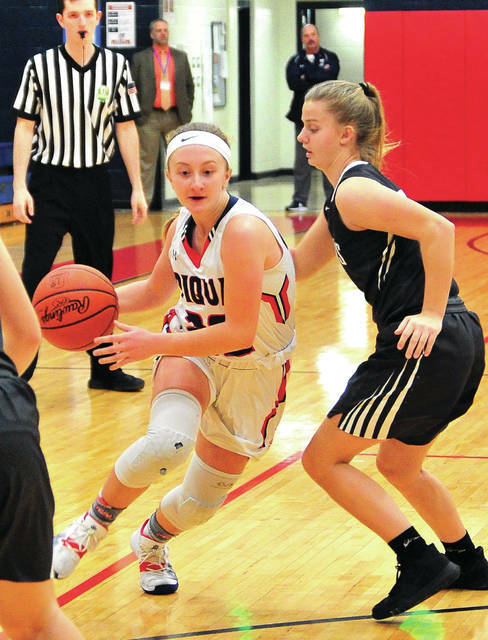 On Wednesday at Piqua Junior High, despite the fact Stebbins lost second-leading scorer Shelbie Morgan to injury in the first quarter, Piqua led just 38-35 going to the fourth quarter. Freshman Kaitlyn Seibel was a big reason for that, finishing with 13 points and seven rebounds. Fortunately, Piqua had an even bigger weapon on display. Junior Tylah Yeomans just gains confidence with each game and her athletic ability makes her tough to stop. She can take passes off the mark and somehow make the catch and get her body squared up for easy baskets. She can slice through a defense and she can even hit a 3-pointer when you need it, which seems almost unfair. 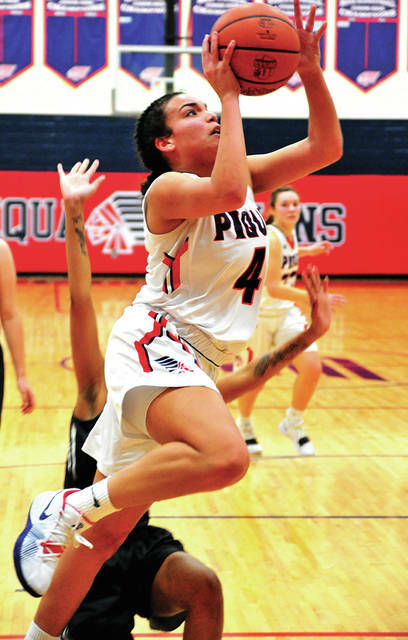 Yeomans did exactly that to open the fourth quarter as Piqua scored the first eight points to go up 46-35 and pull away from there after leading 14-12, 27-22 and 38-35 at the quarter breaks. The result was 23-point, eight rebound effort to lead the Lady Indians. Another reason for Dolph’s relief was just getting back on the floor. Piqua’s last game before Wednesday was Jan. 9. And a final reason he was feeling after the game was the gutty effort of freshman post Aubree Schrubb. Schrubb, returning from a stress fracture, had six points and eight rebounds. Another big key Wednesday was the number of places Piqua found points. Kenzi Anderson and Izzy Kidwell both scored seven points, while Kelsey Bachman and Karley Johns both finished with five points. Hailey McPherson grabbed five rebounds. Kristine George added nine points and seven rebounds to the Stebbins cause, while Haley Gunter and Daleasha Moore grabbed six rebounds each. Piqua was 20 of 50 from the floor for 40 percent and 11 of 19 from the line for 58 percent. Stebbins was 15 of 50 from the floor for 30 percent and seven of 13 from the line for 54 percent. Stebbins won the battle of the boards 33-32, but had 13 turnovers to Piqua’s 11. After a win which allowed Dolph to breathe a sigh of relief. Kaitlyn Seibel 5-3-13, Shelbie Morgan 1-0-3, Kennedie Lingg 2-0-5, Kristine George 3-2-9, Korina Murphy 2-1-6, Haylee Gunter 1-1-3, Olivia Newlin 1-0-2, Deleasha Moore 0-0-0, Bailey Roche 0-0-0, Kate Johnson 0-0-0. Totals: 15-7-41. Tylah Yeomans 8-6-23, Izzy Kidwell 3-0-7, Andrea Marrs 1-0-2, Kelsey Bachman 1-3-5, Kenzi Anderson 3-0-7, Hailey McPherson 0-0-0, Aubree Schrubb 2-2-6, Skylar Sloan 0-0-0, Karley Johns 2-0-5, Chloe Stewart 0-0-0, Reagan Toopes 0-0-0. Totals: 20-11-55. 3-point field goals –– Stebbins: Morgan, Lingg, George, Murphy. Piqua: Yeomans, Kidwell, Anderson, Johns. Records: Stebbins 4-12 (1-7), Piqua 11-4 (7-3). Reserve score: Piqua 42, Stebbins 37.